Get deeper into Messy Church Theology for that healthy balance of reflection and practice that impacts on your local church and community to help you make real-world disciples. 'Messy Church Theology' is the very first Messy Church book to discuss the nuts and bolts of academic theology which takes place among the glue pots and glitter pens. With a rich variety of Messy Church leaders, pastors, and theologians (including John Drane, George Lings, & Beth Barnett) this first-of-its-kind book gathers together 12 essays to encapsulate the theology of Messy Church. Inside you'll find relevant and engaging discussions around the internationally acclaimed project which assess the practices, the community, and the impact. Amongst these theological musings are 5 fascinating case studies, researched and written by grass-roots practitioners, including topics such as special needs. Messy Theology is a healthy balance between critical reflection from a variety of perspectives, and a lively representation of the current theology driving the world renown movement towards making disciples across the globe. George Lings is Director of Church Army's research unit, which for over a decade has been at work discerning the evolving mission of the church and the resultant Fresh Expression of the church. Case Studies by Trish Hahn, Alison Paginton, Christine Barton, Kevin Metcalfe, Sharon Pritchard, and Marie Beale. Messy Church Theology by Edt. George Lings was published by Messy Church in October 2013 and is our 5740th best seller. The ISBN for Messy Church Theology is 9780857461711. 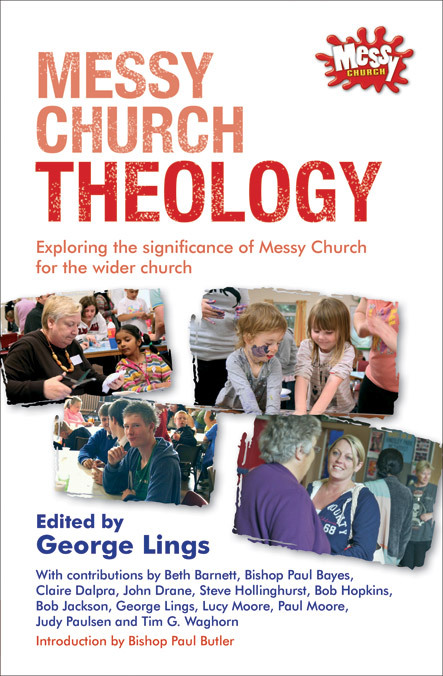 Messy Church Theology is set out in a series of chapters from a range of contributors involved and active within the thriving Messy Church community. As such it sets out ideas of what Messy Church is, and isn't, in relatively clear language —though to be fair there are times when as you might expect it becomes a little tautologous as the same idea is expressed by multiple contributors. It also attempts to show models of how Messy Church works, and can work in parishes, communities and churches up and down the country by using case studies that ground the idea of what Messy Church is and the idea or 'theology' behind it. It then attempts to broaden this out a little to demonstrate how this can, would, and should look in a wider sphere of 'Church'. It is largely anecdotal in feeling and format, though there are in here real figures, representations, graphs, and studies too, but much like the feeling of Messy Church the book retains a much more anecdotal or personal feel to each chapter. The same can be said of the 'theology' in it. There is not here an overarching highbrow academic view but instead it is again the personal insights, the day to day realities, the man on the ground, and those being outreached style at work here that aims to make 'theology' something we all can do and understan. And herein that lies the reason why this book would be an interesting book for those outside looking in at what Messy Church is and can be and how perhaps they might want to consider it more in context for their own settings. A book I think would be recommended for any outside the Messy Church arena to read to see a deeper picture of Messy Church. Got a question? No problem! Just click here to ask us about Messy Church Theology. Case studies by Trish Hahn, Alison Paginton, Christine Barton, Kevin Metcalfe, Sharon Pritchard and Marie Beale.